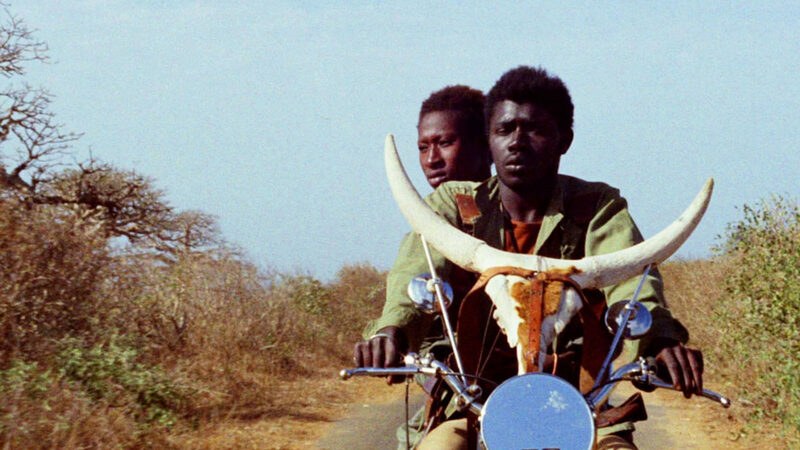 “Paris…Paris…Paris…” We hear Josephine Baker croon the capital’s name in a loop throughout Djibril Diop Mambéty’s postcolonial fever dream of a film, a constant refrain that punctuates the adventures of Mory, a herder who cruises around on a motorbike adorned with a cow skull, and Anta, a university student. This pair of outsiders, strangers in their own country, dream of leaving Senegal for a new life in France, and grift their way into the money for the voyage, but the past is not always so easily left behind. A Thousand Suns, a portrait of Magaye Niang, the nonprofessional actor who played the lead in Touki Bouki, was directed by Mambéty’s niece, Mati Diop. Fusing documentary and fantasy, Diop follows Niang from a screening of the film to his farm in Senegal as the old man comes to terms with the vanished past he longs for and the future he still hopes is possible. Touki Bouki restored in 2008 by The World Cinema Foundation at Cineteca di Bologna/L’Immagine Ritrovata in association with the family of Djibril Diop Mambéty. Restoration funding provided by Armani, Cartier, Qatar Airways, and Qatar Museum Authority.